This is a review by Brian Charity of Russell Howard’s ‘Right Here, Right Now’ live gig, at Belfast’s Odyssey Arena, on the 1st March 2011. Having purchased my girlfriend both of Russell Howard’s two previous tour DVDs (‘Russell Howard Live 2008’and ‘Dingledodies 2009’), I decided to go one better and actually give her the chance to see him in the flesh on his ‘Right Here, Right Now’ tour. Plus I like Mock the Week. And Russell Howard’s Good News is clever. But as far as considering myself a fan of the Bristolian lad, I’ll be honest, I felt like a bit of an impostor as I walked amongst the hoards of excitable young girls. Don’t get me wrong, I never disliked him. I just didn’t love him as much as I love Tim Minchin or Flight of the Conchords for that matter. So, my hopes for the show were not exactly sky high. All the signs looked ominous. The Odyssey Arena in Belfast is a massive place, one which would send shivers down the rock-infused spines of Snow Patrol or Green Day, never mind a little guy with a funny accent and an even funnier sense of humour. All Howard had at his disposal on stage was a microphone and an arm chair. Nothing to hide behind. No props. No pyrotechnics. Just something to talk into and somewhere to sit. The sadistic part of me expected him to fail. However, from the lights went down and Fatboy Slim’s anthem started up, Russell Howard had the audience right where he wanted them. Howard started off pretty safely, poking fun at Belfast squirrels (literally) as well as mimicking the ‘Norn Irish’ accent, much to the delight of his adoring public. He then shifted up a gear and destroyed all popular culture, from Bieber to Twilight, Gaga to the television phenomenon ‘Take Me Out’, every joke not just hitting the mark, but annihilating it. Even jokes I had heard before, about his Granddad playing dead to scare the family for instance, all had a zest and a childish excitement, like someone had filled their son full of sugar and told them to get up on stage and show off. Howard’s tone sometimes slipped from the inspired to teetering on the edge of offensive, though never crossing the line which comedian and close friend Frankie Boyle does on a regular occasion. Howard drew on inspiration from his peculiar family, his beloved girlfriend, and his experiences growing up in a world with an unnerving burglar and strange urges (both of which are connected, actually). His set seemed rough round the edges, giving the audience a real personal experience, rather than a very polished version of a tour paraded up and down the country. He went off course quite regularly, buoyed by the applause from the crowd, which rippled seemlessly after every second joke. He even dabbled with some visual jokes in the style of his BBC Three show ‘Russell Howard’s Good News’, some working more successfully than others, but all very intelligent and very enjoyable. Then came the encore. I’ve seen my fair share of encores in my time, some which because they are totally unscripted, can often be the best part of the show, others which have seen a comedian flounder, leaving the whole night a little bit flat. Howard coaxed questions from the rowdy audience and immediately fans held the breath, knowing just how fatal heckles can be. But Howard, only 30, bounced away heckles like a pro, and in my opinion, showed Howard at his best. He listened ‘carefully’ to each question, which ranged from giving out hugs to what he wears in bed, and managed to turn an already incredible show into something not short of a masterpiece. It was Howard’s best work to date. No question. The whole night was perfectly pitched, full of hearty belly laughs and showed a young comedian with more potential than many established ones before him. If you get a chance to see him, I insist that you do. 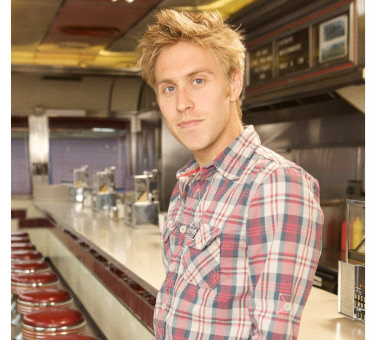 Russell Howard’s ‘Right Here, Right Now’ tour DVD is to be released in time for Christmas. I know for a fact I will be purchasing yet another Howard stand-up. However, this time, I might just keep it for myself. Right Here, Right Now Live Gig Review by Brian Charity. Image copyright of respective owners. It was a good show! 🙂 First standup I’ve ever been too! It’s funny on tv, 10x more funny in real life!